We've already seen some good stuff from Transformers 4 including several other vehicles revealed, including a potential villain and a more low key paint job for Bumblebee, but we've yet to see any of the human cast members on set. Yes, there have been some paparazzi snaps floating around, but we don't post that garbage here. Instead, Paramount Pictures has just released the first official production photo featuring Michael Bay standing like Peter Pan with some metallic set piece. Plus, some of the crew is pictures along with stars Mark Wahlberg and rising star Jack Reynor. It's not much of a revelation, but check it out! 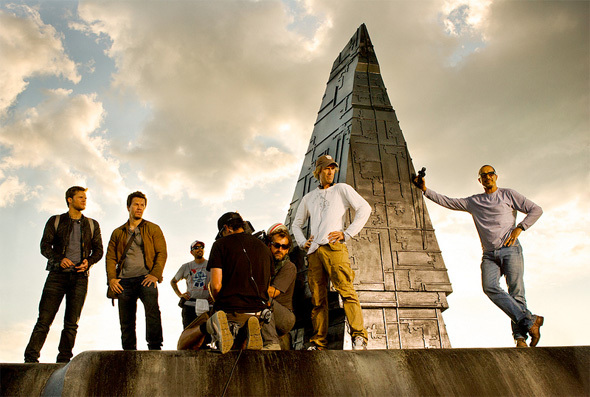 I bet that whatever happens in Transformers 4, it won't have any kind of continuity with the previous 3. Wow, you're really making a crazy bet with that one. It's not like they've been saying that since the beginning. It's not like everyone doesn't already know that. Well done. Also looks like it could be an Uncharted movie. Why humans have a more important roles than the Transformers on the movies? That's why i don't like the Transformers movies but i love the series. Please, no dumb story line. Less bumblebee, more of other autobots. And please have all transformers (autobots and decepticons) transform into what they're supposed to transform to reflect the comicbooks/cartoons in the best way possible. This simplicity will go a long way for diehard fans. It's not just die hard fans that watch these movies and not everything translates from comic books & cartoons to the movie screen. Yeah imagine megatron transforming into a pistol, how lame would that be. UNICRON! UNICRON! or at least GALVITRON! GALVITRON! No! No Galvatron! They already brought Megatron back in the second film and it was epic that Optimus killed him in the third for good! It would be really interesting if they brought the Quintessons in this one somehow.